To be considered for participation in African Fashion Week Houston 2018 please complete the inquiry form below before August 31, 2018. Beautiful Clothing that is created specifically for the individual Woman. Looking Beautiful is definitely important to a Woman. SkirTisfashion is for you. B.Divine was birthed out of a desire to see women embrace their beauty from the inside out. Rather than feeling beautiful because of the clothes you wear, let your inner beauty be reflected by the clothes you wear. 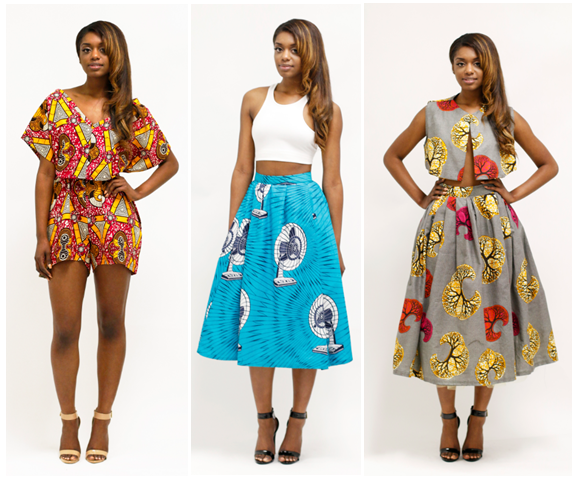 Established in 2010, Kachi Designs is the brainchild of self-taught designer Chigozie Chi Chi Anaele. Her Nigerian heritage is an essential part of her brand and the creative director creates contemporary and vintage-inspired apparel and accessories influenced by African culture, as evidenced by her use of Ankara. Whether ready to wear or couture, her colourful, eclectic designs appeal to the fun-loving side of every woman and bring life and sophistication to any wardrobe. Specializes in bridging the gap between the plus size and standard world.highlighting all body shapes and sizes under the model district group brand. HHM Creation clothing line is an umbrella brand that provides customers with fashion and decorative arts products which help them express their multicultural values, appreciation of beauty, design and concern for the community. The value that project HHM brings to its clients is built on an authentic story and signature, original design, inspired by traditional African inspired cultural aspects. Perfect Reflections is brand that operates along the lines of aesthetics, cosmetics and fashion, where we "enhance beauty, create style and define fashion". From her childhood passion, creating styles on paper and for her numerous dolls, Zino (the designer), as she is generally known as, nutured her aesthetic flair both in makeup artistryas well as her other artistic talents and fanned her fashion flames birthing ZINÓ, the fashion label, a baby of her mother brand, Perfect Reflections. From the vast expanse of great Nigeria, to the western shores , currently in the city Houston, ZINÓ creates styles fitting for the varied persona of her clientele and gives fashion a fresh definition. Bold designs with classic vintage aesthetics. I agree that I have read, understood and will abide by the terms of entry and guidance notes set out below. I accept that decisions made by the selection panels are final. I agree that participation is based upon review and approval by the Designers Committee. I agree to pay the appropriate Participation Fee by September 7, 2018. I acknowledge that failure to make the payment by this date will result in the removal of my line from AFWH 2018. I acknowledge that the Participation Fee and any other fee I pay is non-refundable. Participation includes a show slot with the standard stage, sound and lighting equipment. Allocation of the show slot is at the discretion of the Designers Committee. Models, hair and makeup services will be provided by AFWH 2018. If I intend to use my own model, hair and/or makeup services, I acknowledge that I must submit the request to the Designer Coordinator by August 14th, 2018 for consideration by the Designers Committee. I agree to abide by established times for scheduled appointments, interviews, deadlines, briefing, rehearsals, fittings, special appearances and other matters relating to the show. I acknowledge that the AFWH 2018 has the right to terminate my participation in the show for violation of this requirement. I agree to provide FOSE the following documentation for consideration of this application at the same time of submission of the application. a. A portfolio of garments or accessories created in the last 24 months. b. Copies of past press and/or tear sheets of media coverage. c. High resolution professional photos. e. A brief biography of the designer and label (directing AFWH to my website is not sufficient to fulfill this requirement). I acknowledge that AFWH is authorized to use photos submitted with the application for any promotional purposes. AFWH reserves the right to use all images derived in any form during or from the event and to transform the same into any or all forms of media currently in existence or yet to be created. I agree that I have legal rights to use the images used in the ad space or fashion show space in AFWH I have purchased. I further agree that by sending my materials for print and/or online advertisement with AFWH, I have granted AFWH the license to use for promotional purposes free of charge. I acknowledge that I will have my own assistants to ensure all garments are hung properly, taken care of, and to assist with dressing the models at AFWH. I agree and acknowledge that I undertake to attend AFWH 2018 at my own expense. AFWH may be able to arrange special discounted airfare, hotel and freight services, for which I may be eligible at my own expense. Rolling racks and hangers will be provided. Please inform AFWH of how many racks and hangers you will need by making a request to designers@afwhouston.com. If I reside in Houston, Texas, I agree to attend mandatory scheduled fittings and dress rehearsals. If I reside outside of Houston, TX, I agree to attend the mandatory scheduled rehearsal prior to the event, in which my designs will be present for fittings and rehearsal with the models. I acknowledge that AFWH will not be held liable for personal losses or injuries to participants, models or affiliated personnel except where such loss or injury is due to gross negligence on the part of AFWH. I agree to liaise in advance of the event with the assigned Production Assistant in respect of appropriate music for the show in which my designs will be showcased, and with the designated makeup and hair consultant regarding my desired makeup and hair. I agree to keep all confidential information strictly confidential by using a reasonable degree of care and not disclose any confidential information I receive to any third party. I acknowledge that AFWH reserves the right to either postpone or cancel any function of the entire event in its sole discretion, without any liability for loss incurred thereby. In this event, AFWH will refund all applicable fees. I understand and accept that AFWH reserves the right to review all designs and garments at any time prior to presentation at the designer show to ensure quality and completion, and further has the right to remove any garment or design from presentation if it deems appropriate to do so. I acknowledge that this agreement, along with any other document referred to here, is the entire agreement between the parties (the Designer Applicant and AFWH) and I have read and understood its terms and conditions. Any right, benefit or obligation due to me under this Agreement is not assignable without the prior written consent of AFWH. The laws of the State of Texas shall be the applicable law of this Agreement. By completing the application form, I undertake that all information and data provided are true and correct and agree to abide to all terms and conditions and the submission deadlines of the fashion show as stated by AFWH. Fashionista Alero Hans is the President of Effects Couture By Ronnie Alice, based in Houston, Texas, and known for her exquisite ready-to-wear contemporary African apparels and accessories. Her passion for fashion and “statemented” outfits has earned her the nickname “Effects” from her youthful days and despite her career in the medical profession, her love and passion for fashion has transitioned into a vintage brand, inspired by rich African heritage. ……Proudly African!!! Dorcas Couture was founded in January 2015, by Nadine Hancock in honor of her mom, the late Dorcas Elaine Gentles, who transitioned home October 22nd, 2010. As a child Dorcas passed her love for fashion to Nadine, who as the tender age of 14 attended pattern making classes to learn more about fashion. Ethiopian designer Teshalech Tadesse uses natural fibres from the enset plant (also known as false banana), and woven cotton to make organic, eco-friendly clothing. The results are unique, breathable garments with a bohemian vibe. Inspired by her mother, who grew enset, and her shoemaker father, the fashion entrepreneur also makes fashion and home accessories out dried by product of the everyday Ethiopian crop. House of Julyet Peters is a fashion brand that offers products ranging from made in Nigeria clothing to fabrics and accessories as well as services in fashion and design training. Founded informally in 2012, the company is situated in Lekki, Lagos state, Nigeria. Dangamacin Clothings is an online design label based in New Jersey. Dangamacin clothings has been in existence since 2005. We acquire high quality fashion apparels and modern African inspired fashion with accessories for men, women and children at affordable prices to our customers. #InWakanda fly for all occasions. We specialize in ready to wear African cloth and custom made cloth.